12. Who are the best doctors in my network? Now that many health insurers are giving stingier reimbursements to patients who venture out of network, finding a great doctor who's in your plan is key to keeping costs down. 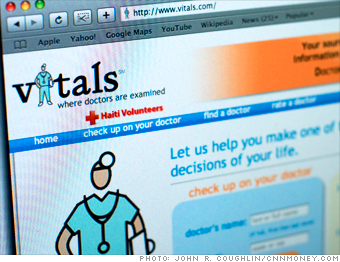 You need Vitals -- a comprehensive physician-rating site that can show you only doctors who are covered by your health plan. It tells you their education, board certifications, work backgrounds, and patient ratings. Coolest feature: Sick and not sure what kind of doctor you need? Input your symptoms and Vitals will guide you to relevant specialists near you. Try this too: pricedoc.com, a new site that shows you what specific doctors around the country charge for various procedures. NEXT: 13 Which hospital should I go to?